The Cobalt Works’ collection of Theodor Kittelsen’s works is an integral part of the industrial museum. The collection is displayed in the Th. Kittelsen Museum at the Cobalt Mines. Here you will find many of Kittelsen’s woodcarvings, including a cupboard, desk, log chairs, waste paper bin and friezes donated by the family. Blaafarveværket has continued to add to the collection of paintings, watercolours, drawings and now has a substantial collection of Theodor Kittelsen’s art. 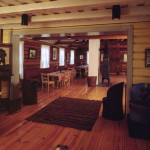 In 1987, Kittelsen’s surviving children, Nanna and Helge Theodor approached Blaafarveværket to see if they would consider building a permanent museum for their father’s works of art. There were a number of artefacts still in the family that they would gladly donate to the Museum if this were the case. This coincided with Blaafarveværket’s work in restoring and making available to the public certain technical memorabilia from the Cobalt Mines. 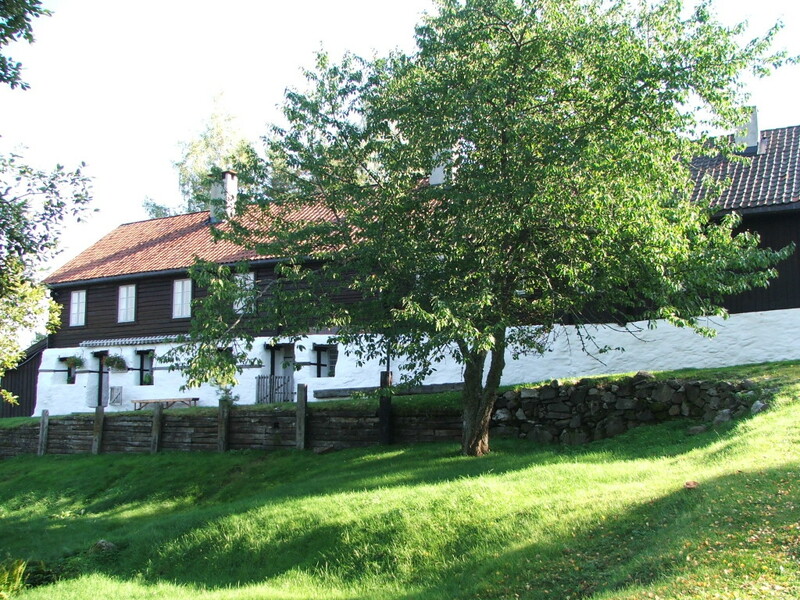 Residential accommodation for the miners, situated on Skuterudhøyden, was dedicated as a national Kittelsen Museum. The donation from the family consisted of considerable wood carving works including a bookcase, work table, chess set, waste paper bin, two log chairs and a number of friezes. These were artefacts that were included in Kittelsen’s exhibitions during his lifetime, but which were also used in the family home. The donation also contained some of the artist’s personal belongings including items he employed in his work. The museum was opened by King Harald of Norway on 21 May 1993. The gift from the family did not include any of Theodor Kittelsen’s original works. Nonetheless, Blaafarveværket has meticulously built up the collection through its policy of making purchases every year and placing particular emphasis on the nature poetry created by Kittelsen during the years he lived in Sigdal. The collection includes masterpieces such as Nøkken som hvit hest, 1909, Nyttårsny, 1905, Soleglad, 1906 and Husmand, 1913. It also includes copies in oil of Bergtrold, 1905 (with a carved frame), Troldfulgen, 1895 and Kisteguld, 1892, extracts from Kittelsen’s illustrated poetry Troldskab (1892). His landscape poetry is represented with images such as Skoglandskap med tjern (undated) Fra Lauvlia, 1904 and Andersnatten ved Soneren, 1908. The more humorous aspects of the artist can be seen in works such as Nisser og dverge bygger i berget (1907), En taler ved stegen, En Maalstræver (1910) and Å Hutte Tu! (1903). Along with Kittelsen’s decorations for the Holmenkollen Tourist Hotel in 1896 can be found both the original sketches (9 sheets each with multiple characters) and carved figure-friezes carrying the hotel’s motifs. The collection also contains a number of drawings – both illustrations (to Asbjørnsen’s Adventures series, Mathias Skeibrok’s Skrøner, Johan Herman Wessel’s Hundemordet, Theodor Caspari’s Kampen for tilværelsen and Kittelsen’s Fra Lofoten) and freestanding motifs (Kirke i sne, Dompap, Julebesøk), as well as graphic works (Du slette tid!, Soria Moria Slott, Nøkken, Øde, Hellebekk). In addition to all these, there are also curios like the carved Domestic Decalogue containing Wergeland’s poetry, a hand-made Christmas card with a drawing of a gnome and 7 original letters from the artist to various recipients. Exhibitions accompanied by special publications are marked with an asterisk (*). The two major Kittelsen exhibitions at Blaafarveværket and the Cobalt Mines in 1995, which included 203 exhibited works, were accompanied by a 152-page catalogue, with colour illustrations. The textual material of the book included, in addition to excerpts from Kittelsen’s own stories and his autobiography Folk og Trold – Minder og Drømme, extracts from previously published texts by Christian Krohg, Christian Skredsvig, Theodor Caspari and Ingerid Kittelsen Treider. A facsimile of Svartedauen (1900) was also published as an accompaniment to the exhibition of Kittelsen’s original illustrations for Svartedauen at the Th. Kittelsen Museum in 1998. The exhibition, “Trollbundet av landskapet” at the Cobalt Mines in 2007 to celebrate the artist’s 150th birthday was accompanied by a 104-page catalogue illustrated throughout with colour reproductions of all the borrowed 31 works and the collection in-house. Art historian Aud-Kristin K. Haldorsen wrote an introductory text about the artist’s life and works, while art historian David Aasen Sandved wrote a special study on Kittelsen’s relationship with Art Nouveau. The catalogue for the 2014 exhibition will be published by arrangement with the National Library on 24 April 2014.